Chemical engineers—sometimes known as process engineers—design, implement and improve technology to make life more comfortable and safe, while minimizing the effect that we have on the environment. 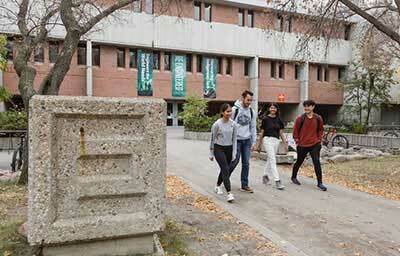 All first year engineering students will take a common set of classes before entering a specialization, such as chemical engineering, in their second year. The lectures and problems will illustrate the use of energy and material balances in chemical and biochemical engineering processes. Topics include the treatment of vapour-liquid equilibria at high pressures, expansion and compression of fluids, steam power-plant cycles, liquefaction of gases and refrigeration. Students will work in teams and perform a detailed design of a chemical engineering process including plant layout, Process Flow Diagram (PFD), material and energy balances, simulation, equipment sizing, costing, safety and economics. Each student will act as team manager for a specific phase of the project. Projects will be provided by the course instructor. This option provides specialization in sciences/engineering courses that apply to traditional bioprocessing industries such as food and beverage processing, enzyme production, biofuels and pharmaceuticals. The Chemical and Biological Engineering Mineral Processing Option offers you the opportunity to take six courses that focus on the discipline of mineral processing. The petroleum option provides you the opportunity to take courses that focus on petroleum engineering, oil/gas engineering and bitumen upgrading. The Engineering Professional Internship Program is a full-time internship opportunity which includes a minimum of eight months of professionally supervised work experience. By participating in an internship, you're able to apply the theoretical knowledge you've acquired during your undergraduate studies in a practical and challenging workplace environment.